In the past Ed Wood’s infamous sci-fi flick Plan 9 from Outer Space (1959) has been dubbed the “worst movie ever made”, but I think this charge is highly debatable. True, it is incredibly amateurish, but there’s nothing particularly offensive or degrading about it… and it does manage to tell a coherent (if rather lacklustre) story, with an identifiable conflict, development and resolution. The acting can get a bit ropy at times, and its obvious that a few cast members are simply reading their lines from hidden cheat-sheets… the dialogue ranges from ridiculous to tedious… the sets (such as they are) often wobble when people walk through them… the framing is artless and off-centre… occasionally a scene will fluctuate from day to night and back again, as contradictory footage is hacked together willy-nilly… in fact, at times it almost seems as if Wood has deliberately set out to make an educational film for aspiring directors, demonstrating all of the potential pitfalls a first-timer on a tight budget could make… but all of these flaws add up to a remarkably entertaining and enduring comedy of errors, which has outlived many of its more competent contemporaries. 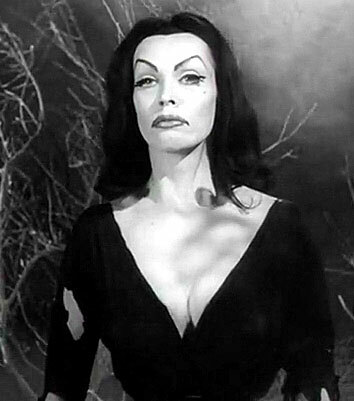 Obviously the most eye-catching female cast member is Maila Nurmi, aka “Vampira”, who plays the deceased young wife of an elderly man (Bela Lugosi), who is resurrected one night by meddling aliens, intent on getting the U.S. government’s attention any which way they can! It isn’t much of a “performance”, since all Nurmi is really required to do is shuffle around a graveyard, zombie-style… but she looks so fabulous in her proto-Goth get-up, it’s easy to see how she became such an iconic character! 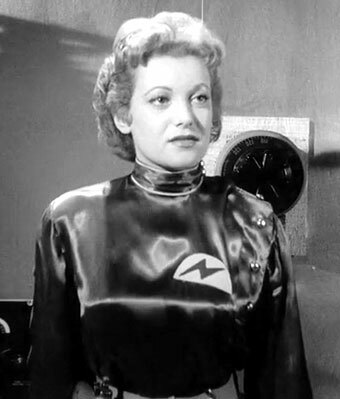 Meanwhile, the most successful cast member, in terms of post-Plan 9 career achievements, has to be Joanna Lee, who plays one of the aforementioned meddling aliens, who controls human corpses with her trusty electrode-gun. After a serious car accident prompted Lee to reevaluate her life, she switched from acting to scriptwriting, and by 1960 had landed a job with The Flintstones, later winning an Emmy Award for her work on a 1972 Thanksgiving episode of The Waltons. That same year, she formed her own production company, and oversaw a documentary about an Olympic athlete named Babe Zaharias, which was also nominated for an Emmy. Over the course of her career she contributed to such classic sitcoms as The Brady Bunch, I Dream of Jeannie, Gidget, and Bewitched. I’ll leave you with a great quote concerning her motivation as a writer: “The women I write about are winners. I want women to win in life.” Amen to that, sister. This entry was posted in Rants about Films and tagged Gothiness, Joanna Lee, Maila Nurmi, Plan 9 from Outer Space, Vampira. Bookmark the permalink.